A few weeks ago, I sent out some basic questions to people I know asking them for feedback on my writing. One of the guys I sent the e-mail to was my friend Judah. Judah and I have differing views on many things, so I knew he would be honest with me and tell me where I needed to grow. He responded back with what could’ve been a book. Most of which was in disagreement with how I think and operate as a writer. I’ve always wanted to have the blog that people thought was written by a “cool” Christian. I love guys like Donald Miller, Jon Acuff, and Bob Goff. They’re wildly successful writers who are Christians even though they don’t always mention Jesus. And rarely, if ever, do they quote the Bible in their writings. It’s the type of writer I felt I was supposed to be. Then I got Judah’s e-mail. He told me to find what I love writing about. I responded and told him my big desire is to not do Scriptural stuff. I want to be Biblically based without quoting Scripture or outright referencing it. There are enough devotional blogs out there that you, the reader, don’t need another guy quoting Scripture and telling you what he thinks. A follower of Jesus cannot claim to be His follower and intentionally choose to leave out His teachings thinking that his own writing style will somehow sound like a follower of Jesus. As I’ve spent time thinking through that statement, I’ve watched my stats on here diminish. One night as I was going to bed, I decided to tell God how frustrated I was. I didn’t understand what was going on. I’d spent so much time trying to build my readership and now everyone has disappeared. With each post I wrote, fewer and fewer people showed up to read it. You’re only telling your story. You’re not telling mine anymore. I’ve been doing the first part of that really well. I write posts about things I care about – going after your dreams, doing what scares you, changing the world. But I’ve chosen to not write about things he cares about. Maybe it’s fear that keeps me from writing those posts. Fear of people not liking them. Fear of people telling me my interpretation of the Bible isn’t right. Fear of backlash. Whatever it is, it’s going to stop. If I’m going to be the person God has made me to be, I can’t be scared of what people will think of that person. I don’t want to be a “cool” Christian anymore. I want to be an obedient Christian. Is there a place in your life where you’re doing what I’ve been doing? Do you know God is telling you to do one thing but, for whatever reason, haven’t gone there yet? What would happen if you moved past the fear or uncomfortableness and just did it? That’s what this post is for me. What’s your version of this? 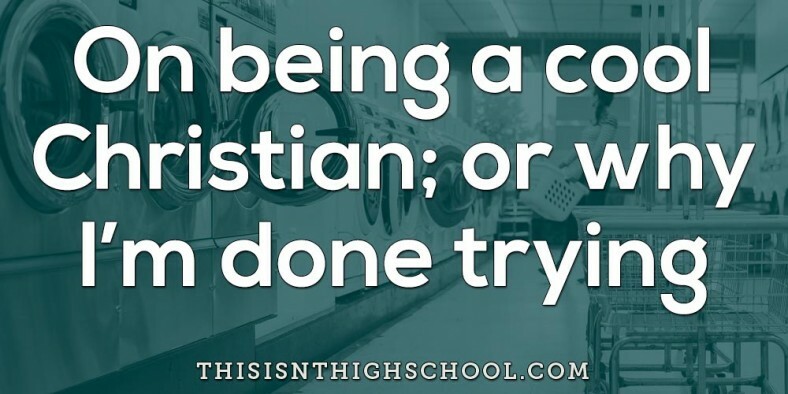 We don’t need a generation of “cool” Christians. We need an army of obedient ones. I remember a song you are probably too young to have ever heard, but it says, “Don’t wanna be a man pleaser, I wanna be a God pleaser.” Stay tender before the Lord and even if/when you mess up, as long as you keep seeking and obeying the Lord, then the rest is gravy. He is our purpose, all else is His favor raining in our lives. Jonathan, I echo what Dayna and Anne said. Obey the One who called you and you won’t fail. While you might not ever be as “successful” as the Donald Millers or Jeff Goins of the world, remember success in those terms is defined by man. However, a willingness to obey God’s calling for your life is worth far more than a million followers on your blog. Love your transparency.